This past weekend we went to our friend’s birthday party and my friend, Angie, made a salad with edible flowers. Of course, many of us know there are edible flowers, but have we ever tried them? I hadn’t tried them before and was very curious! Well, that’s a lie. I had tried flowers once before when I was probably 4 years old and had just watched the movie Bambi. There’s a scene in the movie where the rabbit, Thumper, is eating flowers, and after that my sisters and I searched our backyard and probably ate every Texas wildflower we could find. So, other than that, I had not tried edible flowers. There was quite the assortment of flowers, and they gorgeous of all colors: green, orange, pink, and bright red. They were so pretty you almost didn’t want to eat them. But I did! I was curious so I tried almost all of them. Here’s my review. The marigolds were kind of zesty and spicy, similar to arugula. A lot of people at the party didn’t care for this one, but I liked it. I’m also a fan of arugula. Marigolds have some cool health benefits to that I found out on livestrong.com. They are high in antioxidants and have been shown to help fight cancer. Not only do they help fight cancer, but they help to prevent the regrowth of cancerous cells! The mums were pretty bland and earthy. They can easily blend in your every day salad. Mums are known to help improve cardiovascular health. They can also help relieve high blood pressure and some symptoms of high blood pressure like headaches or insomnia. Lastly, I tried the dendrobium, which are the pretty pink orchids. I thought that these flowers actually had a slight sweet taste to them, and were also pretty mild. I just popped the whole thing in my mouth without any sort of seasoning and had no problem with the flavor. It was pretty tasty! According to webmd.com these flowers are known to help boost the performance of a workout, and act as a stimulant. What do you think? 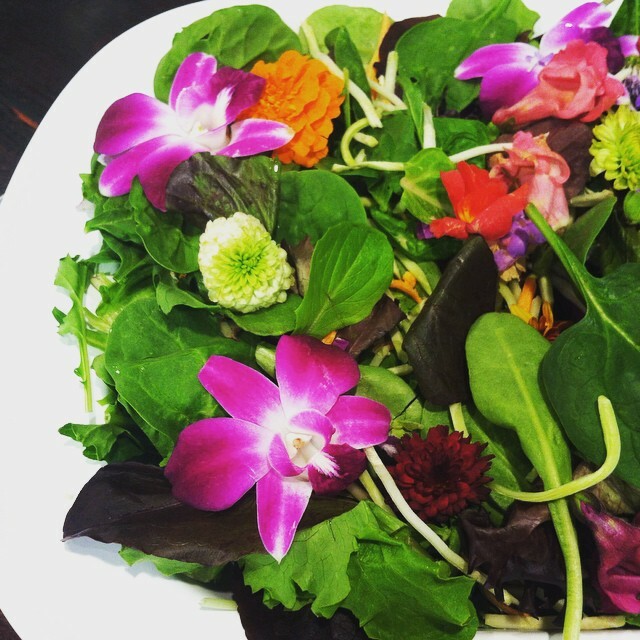 Are you willing to give edible flowers a try? Do you have a favorite already? Disclaimer: I am not a physician. I am just a mom on a mission for wellness and sharing cool facts as I come about them. These flowers are not intended to cure, treat or prevent disease. If taking prescription medication, you may wish to consult a physician before consumption of beautiful flowers.